Dubai, UAE : The most elite MINI yet, MINI INSPIRED BY GOODWOOD, has arrived in AGMC’s showrooms in Dubai. The special edition of the three-door MINI that was developed in close collaboration with the Rolls-Royce Motor Cars design team is set to charm MINI lovers in the UAE. The British origins of the two brands, their shared belief in meeting the individual needs and desires of their customers, and the creative pooling of ideas between the various brands at BMW Group Design, provided the fuel for the collaboration between Rolls-Royce and MINI giving the car a high quality interior ambiance defined by stylistic harmony, masterful workmanship and classic British elegance. 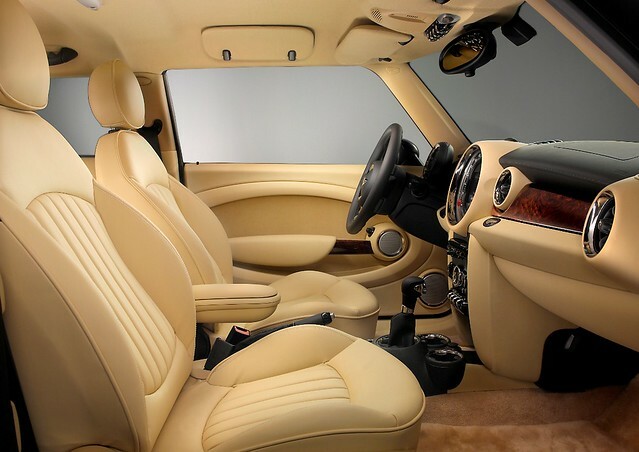 Inside the MINI INSPIRED BY GOODWOOD, a harmonious color concept, selected materials and a production quality characterized by precise craftsmanship guarantee the highest degree of well-being and comfort. The dashboard, including the surrounds of the central instruments and air vents, the centre console, carpet surfaces, the lounge leather seats, the roof lining as well as the door, side and body pillar cladding, all boast the exclusive Rolls-Royce leather color Cornsilk. 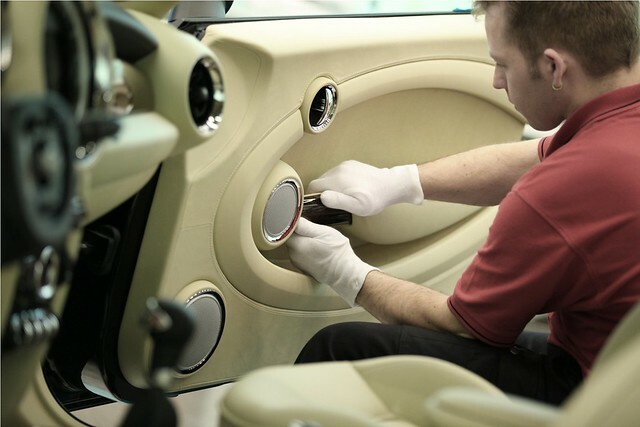 The dashboard and door handle surfaces are finished in Walnut Burr, a wood quality also exclusive to Rolls-Royce, the black nappa leather dashboard top, Tipped Leather Cornsilk door linings as well as Piano Black surface finishes for the buttons on the multifunction steering wheel and the controls below the central instrument, all provide additional quality-enhancing accents. In addition, the car boasts cashmere roof linings, sun visors and rear storage tray as well as foot mats made of a deep-pile lambswool also featured in current Rolls-Royce models. The most striking features of the exterior design are the body finish in the exclusive Rolls-Royce color Diamond Black metallic and unique 17-inch light alloy wheels sporting a multi-spoke design. There is a badge featuring the legend “One of 1000”, which can be found on the center console in front of the gearshift lever. The MINI INSPIRED BY GOODWOOD is available as MINI Cooper S variant only and powered by a l.6-litre 135 kW/184 bhp four-cylinder engine with Twin Scroll turbocharger, direct petrol injection and variable valve control. The power unit, which is featured for the first time in the new MINI Cooper S, impresses with spontaneous power delivery. At the same time it is also the most efficient engine in its displacement class. Moreover, the MINI INSPIRED BY GOODWOOD’s range of high-quality equipment offered as standard also includes Xenon Adaptive Headlights, Park Distance Control, automatic air conditioning, an onboard computer and the audio system Radio MINI Visual Boost, which includes the Harman Kardon hi-fi speaker system. Since its launch in 1959, MINI continues to redefine small car design. A car of substance in abundance, MINI enjoys worldwide popularity among all ages and groups. In fact it was the first small car to achieve genuine global success. MINI not only has a history, it also has its very own personality. A trendsetter in its own right, MINI sets itself apart through its unique interpretation of style and design. Acquired by the BMW Group in 1994, the MINI brand includes the MINI Cooper and Cooper S, MINI Cooper Cabrio, MINI Clubman and the MINI John Cooper Works range of models and now the MINI Countryman. For 36 years, AGMC has delivered premium automotive products to its customers as the exclusive importer for BMW Group vehicles in Dubai, Sharjah and the Northern Emirates. Starting in 1976 with only three cars and three workshop bays, AGMC has expanded over the years as Dubai has become one of the most important markets for BMW sales in the world, consistently amongst the top five performing markets in the entire BMW Group Middle East. AGMC has facilities across Dubai, Sharjah and the Northern emirates; starting with its flagship showroom on Dubai’s Sheikh Zayed Road that features state-of-the-art sales and after-sales facilities, showrooms for BMW, MINI, BMW Motorrad, Rolls-Royce and Certified Pre-Owned vehicles under the BMW Premium Selection Programme, as well as the BMW Regional Training Centre.